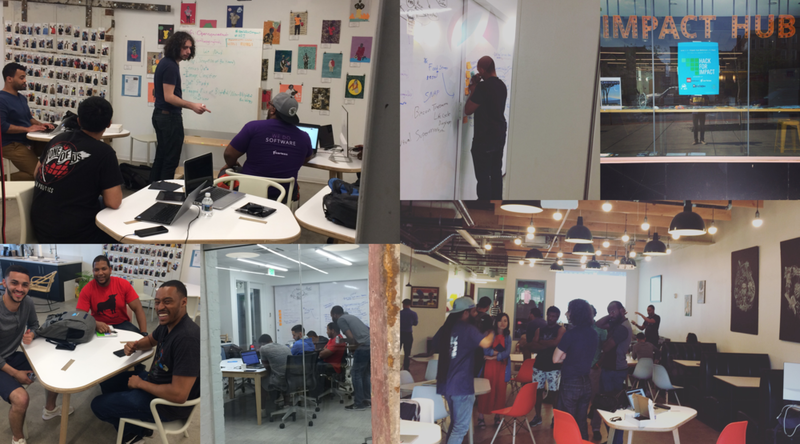 Hack for Impact, the 24 hour hackathon in Baltimore, was a glowing success! The Hack for Impact team want to show appreciation to our sponsors, community partners, event planners, judges, presenters and of course give a big CONGRATULATIONS the winners, Food Chain! Together we were able to collaborate to build and implement solutions for relevant problem statements in the pre-selected categories for crime, health, education, transportation, child welfare, and domestic welfare. One part of the mission is to set an example of how cities can bring together tech innovators and social change-makers in order to solve relevant, painful problems by exchanging ideas, sharing expertise and developing effective solutions. The event opened with an inspiring speech by Aaron Velky on the power of moments! Aaron is the founder of Ortus Academy a non profit that teaches financial intelligence to k-12 students. We wanted to give a special thanks to Impact Hub Baltimore for providing the venue for the hackathon! Impact Hub is the largest entrepreneurial communal network in Baltimore, a key driving force in creating community engagement and they help to create innovative solutions that address sustainable development goals in 50 + countries. We thank our sponsors Fearless Tech, a full stack software development firm in Baltimore that delivers sleek, modern, and user-friendly software designed to push the boundaries of possibility. Fearless is a company that represents the mission of HackForImpact as their website states, "We build software to solve problems. Software has the potential to change lives." Ope Thomas, founder of Roadi, a parking app that tackles the painful problem of finding available parking, was the primary organizer the HackforImpact. The hackathon and it resulted in $3000 in sponsorship value, 57 total registrations, 4 project submissions, and 20 participants who were in the final presentation, which was evaluated by 4 distinguished judges. The judges were Gary McDaniel, Ope Thomas, and Alex Bullignton, Founder and CEO of Arbit. Gary McDaneil is a highly accomplished business builder and decisive leader with an extensive record of successful executive leadership. Alex Bullington, founded Arbit with a goal of helping athletes and brands connect better with their audience. The University of Baltimore, was a strong community partner for the event helping to organize the event and reach the right audience. The University of Baltimore provides Knowledge That Works in a vibrant, urban setting. These sponsors and community partners provided essential support to make this event a success and helped to create dynamic engagement with influencers in the community, the HackForImpact team extends the deepest gratitude. As stated above the HackforImpact team wanted to formally congratulate Food Chain, the winners of the hackathon! Food Chain, devised a solution that will help improve access to quality food for those in a food desert. As part of their next steps to make this vision a reality they have begun conversations with public health experts in Philadelphia and Baltimore to learn what they can about the challenge they want to help improve. Thank you again for your support, the impact of this event would not have been possible without your help! This event was more than simply a hackathon, but together we did the work to investigate ways to be conduits for social change in Baltimore city by addressing it’s relevant problems and creating solutions with technology. Events like these will be the catalyst for swift, effective change in cities all over the world and by creating an atmosphere of inclusion, collaboration, and competition; we will only create more unique solutions to challenging problems which will lead to a higher quality of life for all of us. All of the organizations listed work to provide tremendous social value to the community, and we would love if we could spread more awareness so that more people can be a part of the coming changes with us. Through our collaboration we can merge technology with social innovation so that we may merge and extend our capabilities into horizons not previously known. Please join us on our journey!